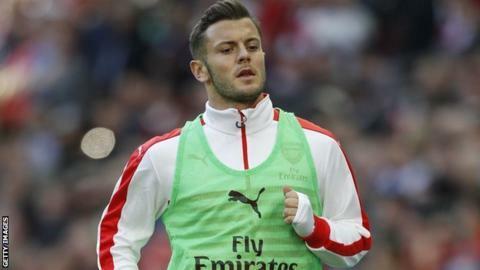 It could be years before Jack Wilshere returns to his best, according to Arsenal boss Arsene Wenger. The England midfielder has been plagued by ankle problems and his manager said he needs a prolonged period without injury to regain top form. Wilshere, 23, was on the bench against Chelsea last week, but last played for Arsenal's first team five months ago. "He needs one or two years without problems to get the full confidence and belief back," said Wenger. Wilshere required surgery after a heavy tackle by Paddy McNair in Arsenal's home league defeat to Manchester United in November, then suffered a further setback in February, needing to have two pins removed from his ankle. Wilshere became the Gunners' youngest debutant in 2008, aged 16, but hopes that he would become a permanent fixture in both Arsenal and England's midfield have been undermined by his troublesome ankles. Both have required surgery since he first sustained a stress-fracture in his right ankle during pre-season in 2011 and was ruled out for 17 months. Speaking before Monday's trip to Hull City, Wenger added that injuries have held the Gunners back in their bid for the Premier League title this season. "We had big injuries at the start of the season and we only got our squad together more recently. Even then we still lost players like Wilshere in November, and then again afterwards. We were not all together. "So it took us some time to find a good balance in the team and we dropped some points because of that. Missing players was certainly detrimental to our results."